Tomato Juice | Summer Special! Ven Pongal | Breakfast Recipes! 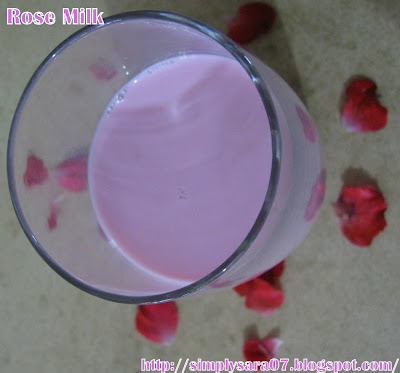 Rose Milk is very tasty and simple drink. This is a favourite drink of my 16months old son for its colour and taste:-) Its very refreshing. I was thinking Rose Milk is very difficult and long process to make so always having it in a restuarant. But my friend here told me Rose syrup is available in super market and its easy to make. Now am very happy after I bought my family likes it a lot and drink daily. Take 2 tspns rose syrup(store bought sugar added some are without sugar too) in a glass and pour cold milk of your choice(Normal, Low fat, skimmed milk) stir well and serve. For children you can garnish few choco chips. This recipe is going to FIL Milk Event by Sanghi and Soup n Juice Event by Sireesha. This can be very refreshing drink after fasting so sending it to Joy from fasting to feasting by Lubna. Rose milk looks so yum! !....nice colour too! You got award awaiting in my blog...Pls do accept it. Wow. It looks yummy and I love the color. If its really beneficial then the process is worth it. Thank you for sharing this. Nice blog with so many traditional recipes.btw,where r u in SG. Nice entries for the event...Rosemilk looks yumm..
Hi Jeyshri, Ramya, Ammu and Rekha, Thanks a lot for your comments and visiting my blog.